When I posted my Sewing Bucket List a few months ago, I wrote that I hoped to be a licensed fabric designer within the next five years. It's something I think about every single day, yet I've felt like it's something I can't talk about freely on my blog. For some reason I've felt compelled to play things close to the vest, and I'm honestly a little tired of keeping my art in the closet. I want to share my work more freely in hopes that maybe the right people will see it. Here are the collections I've completed thus far, but be sure to check out my portfolio site and see more one-off prints and new collections as they are completed. Click any image to enlarge it. Collections are listed newest >> oldest. I had to take three art history courses in college, and medieval art unexpectedly captured my heart, specifically Anglo-Saxon and Viking art. I could never get enough of it. I dream of going to Norway someday to see the stave churches, Viking Ship Museum, and the fantastical landscapes for myself. When the TV Show Vikings aired, I got hooked. I love being immersed in the visuals of that time and place. The prints in Northmen are inspired by pieces from Sutton Hoo (like these shoulder clasps), the Oseberg Ship, illuminated manuscripts, runestones, and other artifacts. My favorite print in the collection is called Voyager, and was inspired by Viking longships. The waves that carry the ships form horizontal stripes that I think would make a really fun novelty dress. I'm all about dresses with quirky prints a la Ms. Frizzle and ModCloth. The collection contains two colorways: Spiced and Pickled. One of my favorite traditional illustration tools is the dip pen. I think it speaks to my inner Romantic. 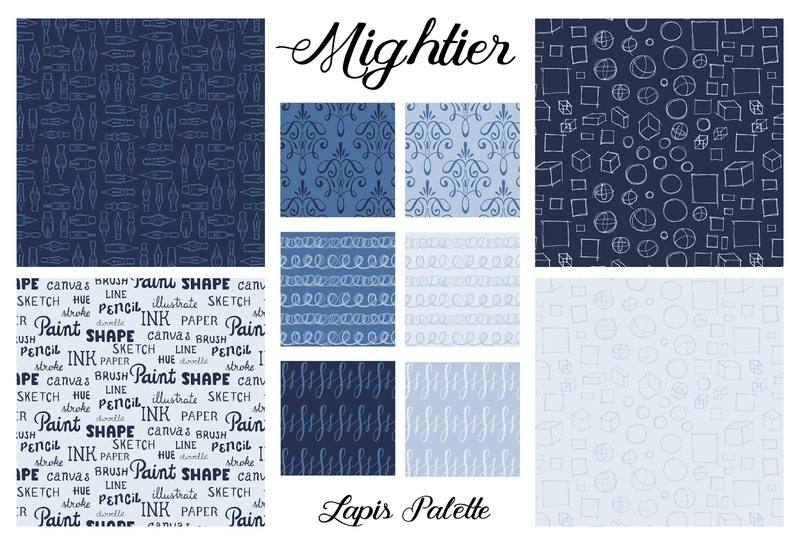 Mightier is a celebration of traditional mark making and a more organic aesthetic. 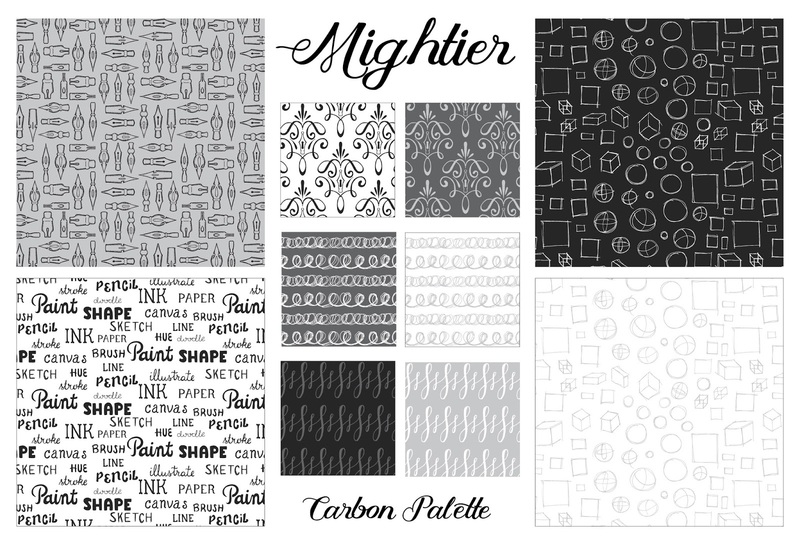 Unlike my other collections, which I usually illustrate digitally, Mightier started out with its traditional roots. All the prints in the collection were created with pen and ink on paper, and later digitized to preserve to their natural, imperfect look. The two colorways, Lapis and Carbon were inspired by traditional ink colors. The collection is a small departure from my usual cute subjects, but still reflects my personal style. I think the limited color palette makes the collection ideal blender prints for quilts. I think many prints would also make mature yet whimsical garments and bags. I'd really love to see these on a cotton/linen canvas! 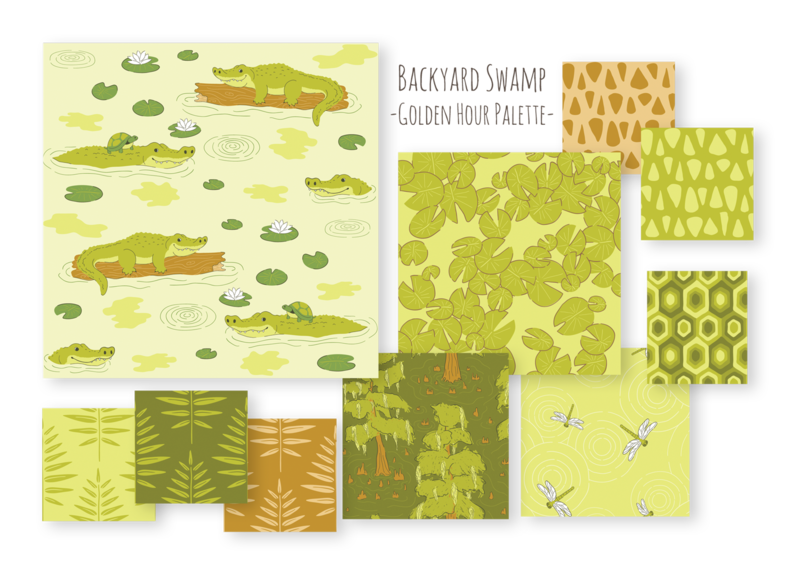 Backyard Swamp is pure nostalgia. Behind my childhood home is a swamp-like man-made "lake" that runs through the neighborhood. A lot of newer master planned communities in Houston have "lakes" that are chemically treated to look pristine and blue, but my neighborhood is a product of the 1970s. The lake was man-made, but nature reclaimed it a long time ago. As children, my brother and I loved playing by the lake. We put on rubber boots and waded through the shallow parts. We caught lots of turtles. We hopped across the knees of cypress trees. My brother loved to scare me by telling me if he said "Allie-allie-alligator" three times, an alligator would come get us. There were alligators in the lake (one decided to sun itself on the grass, trapping me on the trampoline for an entire afternoon once) so I totally believed it. Backyard swamp was envisioned as a collection for little boys, but I think the dragonfly print would be sweet for girls' dresses. The two colorways, Breeze and Golden Hour reflect the change in atmosphere as the sun set in the evening. 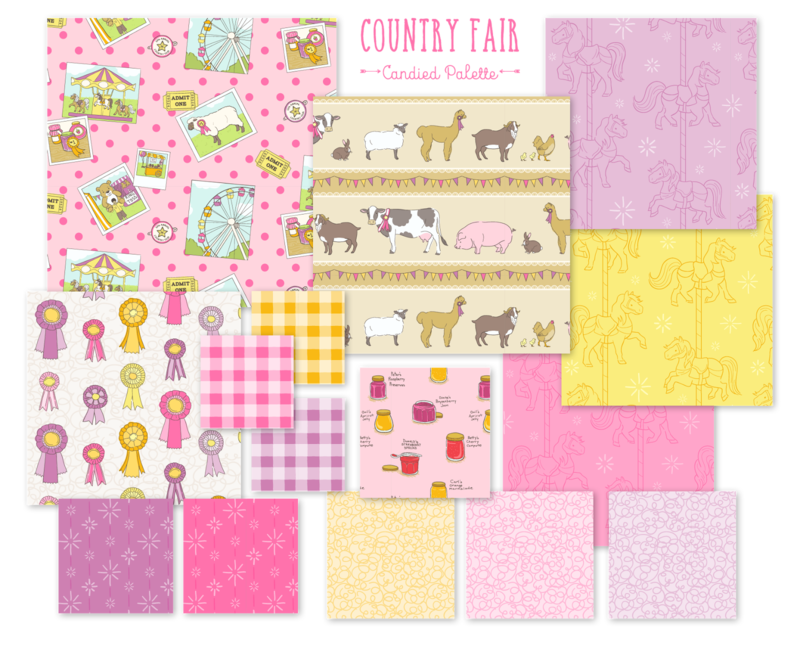 Country Fair is another nostalgic collection inspired by my own childhood and that of my grandfather. Every year, my dad took my brother and I to the Fort Bend County Fair & Rodeo. Despite living in Texas, my brother and I were pretty much "city kids" while our grandfather had grown up on a farm in Pennsylvania during the 1920s. When he passed away in 2013, I found myself wondering more about what his life had been as a self-proclaimed "farm boy." 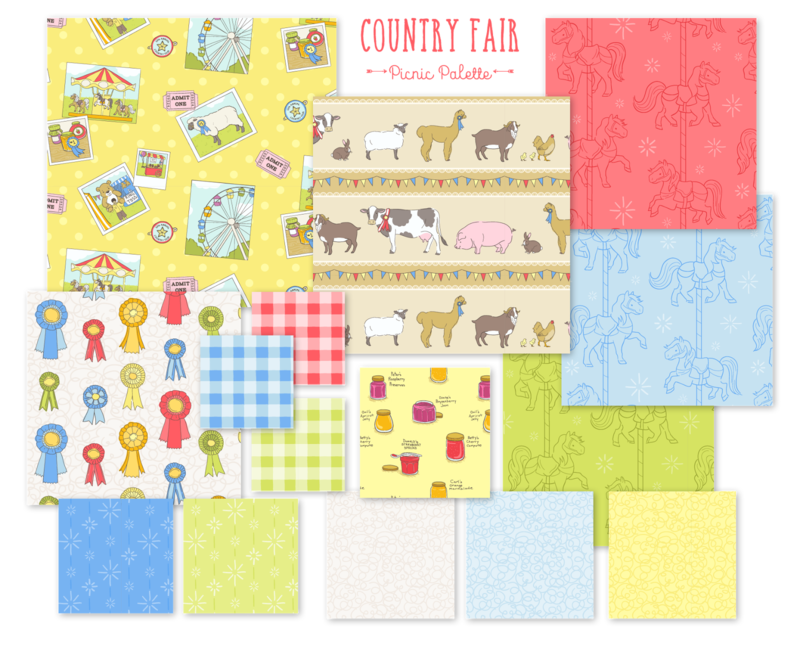 Country Fair is a hybrid of my childhood memories and the simple rural life my grandfather knew. The two colorways, Picnic and Candied were envisioned as palettes for little boys and girls. What's more suited for children than a good old fashioned carnival? 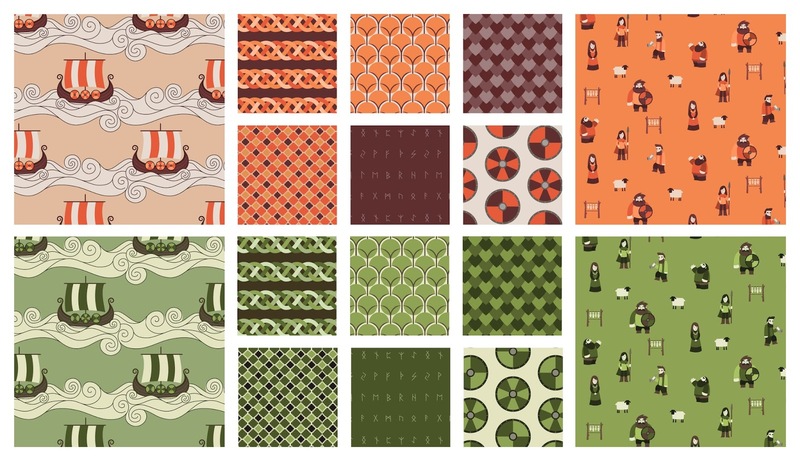 These prints would make adorable quilts and clothing for children. Thanks! I had so much fun working on it. I'm a Norske so love Northman line especially! But honestly they're all wonderful!! I would buy prints from all the lines you shared!! Wow, these are wonderful! I would buy all of the, but especially Mightier and Northmen. These are really lovely! Good luck with your goal -- I think becoming a licensed designer within the next 5 years is TOTALLY achievable if this is what you're start with. I know very little about fabric design but have you thought about Spoonflower? I listen to several quilting podcasts and seem to recall a couple people saying they got "discovered" there. What is a Crafty Swap? Studio Ghibli Swap Sign Up!